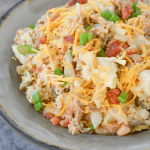 This instant pot loaded keto cauliflower bowl is a rich and flavorful, filling meal that will remind you of a baked potato! Feel free to substitute chicken or other shredded beef as your meat. I did not remove excess moisture from the cauliflower because I steamed it. The slight bit of added moisture from this is necessary to the dish. If you boil your cauliflower, you may find it helpful to remove part of the excess water by using a towel or cheesecloth but do not dry it out completely.